What’s hopping in New Orleans? What’s cooking with Tiana and Naveen? The Shadow Man’s curse has Tiana and Naveen a little green and totally amphibian. The prince and the waitress must break the curse by midnight on Mardi Gras or stay frogs forever. Can they find a princess to kiss Naveen in time? For anyone of any age that loves fairy tales, new spins on fairy tales, or Disney comics and manga, this is a treat. You’ve got a feisty heroine and a hero who’s willing to learn to cook. What else do you need? It’s a recipe for mayhem and a little romance, Disney style! In addition to the story, there’s a really neat info section introducing the main characters with notes about their character, their background, and insights from and about the supervising animator. There’s also a section of manga lover sketches that could be used for coloring or for learning to draw the characters. There are also sneak peeks at other Disney manga titles. Tiana is a hardworking young woman who has always dreamed of owning the finest restaurant in all of Louisiana. When her dreams turn awry, she looks to the evening star and makes a wish, bringing her to face-to-face with the with a frog prince. He promises to make her dreams come true in exchange for a kiss, but when the deal goes sour, they find themselves having to work together in a race against time to put things right. 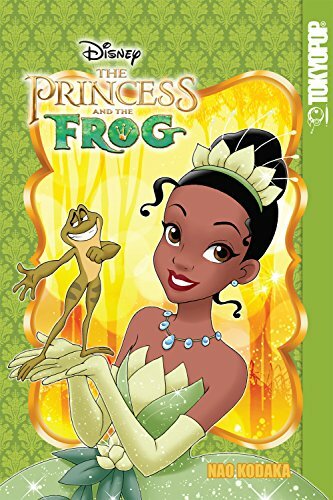 Join Tiana, Naveen, and their bayou friends as they go on an adventure of a lifetime in this magical manga adaptation of Disney’s The Princess and the Frog. Add this to your Disney Manga collection today!